Klout score is the first attempt to measure and quantify a hitherto intangible concept- social influence. It may not be perfect but Klout has revolutionized business promotion, marketing and brand building on the Internet. Targeting individuals with high scores is just one way of taking advantage of Klout. Analyzing trends, identifying characteristics of target groups, approaching individuals steadily improving their Klout scores for feedback and reviews- businesses adopting a holistic approach towards online marketing can make good use of Klout scores- both low and high. Not everybody shares the same clout on the Internet. An individual who has assiduously built up a huge contact base online will obviously enjoy better influence over a wider audience as compared to a first time blogger. The Klout score helps identify those whose opinions carry more weight with other surfers. Companies pay millions of dollars for prime time SuperBowl TV slots. A full-page ad in the NYT costs many times the cost of advertising in a local tabloid. 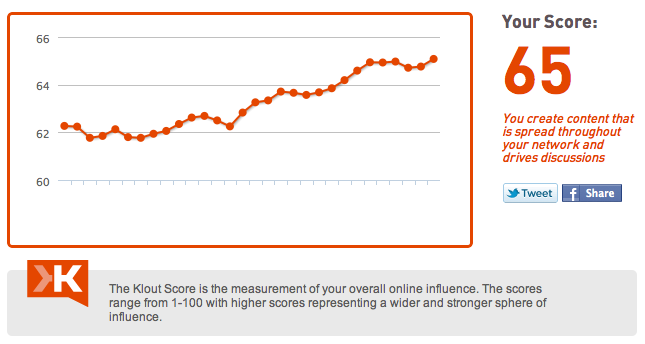 Instead, A Klout score is very well defined to find out the influencers. Brands will go out of the way to keep such a influencers happy to generate positive comments or favorable feedback. It is a win-win situation for brands and customers alike. A person with a high Klout score will do all that is necessary to sustain influence, respect and social contacts. He or she will be an excellent source of reliable feedback for other connected individuals. Klout is three years old and there is lot of scope for innovations and improvements. Scores can be categorized on basis of age, income, gender, occupation, location, political leanings and so on. A firm selling cosmetics will focus on teenage girls living in urban centers with a high Klout score. Social networking has become a part of our daily routine today. Quantifying one’s influence only helps extract more out of one’s efforts at gaining influence. Marketing agencies are looking for employees with high Klout scores. VCs are preferring startups that has worked on its social influential online. Even dating sites are hooking up individuals on basis of their similar Klout scores. People have understood the benefits of measuring social influence and a person without influence on the Internet will definitely lose out in the long run.